A while ago I posted about a rather elaborate Droid X commercial which featured a man’s arm morphing into a mechanical, cyborg arm from which the Droid phone then emerges. This commercial struck me as a useful and vivid illustration of an important theoretical metaphor, deployed by Marshall McLuhan among others, to help us understand the way we relate to our technologies: technology as prosthesis. This weekend I came across another commercial that once again captured, intentionally or otherwise, an important element of our relationship with technology. 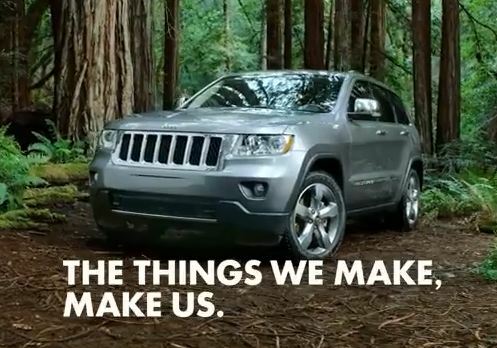 This time it was a commercial (which you can watch below) for the 2011 Jeep Grand Cherokee. The commercial situates the new Grand Cherokee within the mythic narrative of American technology. “The things that make us Americans,” we are told in the opening lines, “are the things we make.” In 61 seconds flat we are presented with a series of iconic American technologies: the railroad, the airplane, the steel mill, the cotton gin, the Colt .45, the skyscraper, the telegraph, the light bulb, and, naturally, the classic Jeep depicted in World War II era footage. As if to throw in the mythical/American kitchen sink, at one point the image of a baseball hitting a catcher’s mitt is flashed on the screen. In any case, the commercial closes with the line, “The things we make, make us.” I suspect that this is an instance of someone speaking better than they know. My guess is that the intended meaning is something like, “Making and inventing is part of what it means to be an American.” We build amazing machines, that’s who we are. But there is a deeper sense in which it is true that “the things we make, make us.” We are conditioned (although, I would want to argue, not wholly determined) creatures. That is to say that we are to some degree a product of our environment and that environment is shaped in important respects by the tools and technologies encompassed by it. Now this may be a bit more than what Jeep had in mind, but thanks to their commercial we are reminded of an interesting and important facet of the human condition.